I still can’t believe I actually raced the Fort William downhill track! Go back 5 years, Fort William was just a track I’d seen on TV, an iconic track in British downhill mountain biking and a track far too long and brutal for me to consider riding let alone racing! 3 years ago I stupidly had a crack at riding the track on a trail bike, so inexperienced I didn’t even know what I didn’t know and had a mammoth crash on the finish line drops and put myself in A&E with some serious concussion. But that is what prompted the start of my progression into downhill. Once I was back on my bike I booked myself on to a coaching course with Katy Curd, she taught me how to navigate drops a skill I certainly should have mastered some months before! From then I’ve learned everything I can along the way and feel like I’ve progressed a lot in my riding. That brings us to now, when thinking about what races to do this year I knew I wanted to be able to race at Fort William at least once in my life, a proper bucket list event for me and I felt ready. I’m not getting any younger, and turning 30 this year I figured I’d go for it. So I entered round 2 of the HSBC National Downhill series. I’ve trained hard over the winter and leading up to race season, with gym sessions and watt bike sessions working towards my main goal of finishing the race at Fort William. It’s fair to say that even after all the training nothing could prepare me fully for the reality of trying to race a track more than double the length of the normal tracks I race, exposed on the side of a mountain in the Highlands. 2.8km of brutality. “Lucky” for us we were even allowed to race part of the new world cup woods section, brilliant, that should make things easier! 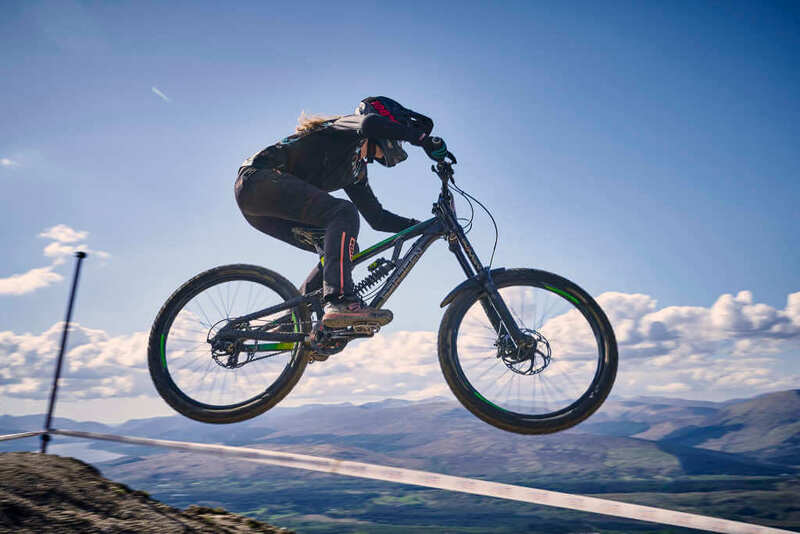 It’s a long way from Cheltenham to Fort William, so we headed up Thursday straight from work and after a brief stop over in Glasgow we arrived at Nevis Range early Friday ready for practice. Unfortunately it was too windy for the gondola so fun was put on hold and we had to track walk instead of ride. Saturday practice did not start well at all, I tried to get a tow in to the motorway section jumps from my boyfriend but he got a flat tyre between the first hip and step down, everything happened so fast and I was going too quick to roll the step down and too slow to clear it so I nose dived and OTB. Fortunately not too injured but a massive knock to my confidence. I picked myself up and set off for a second run. We kind of figured out lines on the rock gardens at the top, as much as you can for a track that’s too long to remember, but the leg burn was immense by the deer gate! The new world cup woods are a crazy twisty turny rock garden with drops on every corner, they were proving tricky for a lot of us, so I was pleased when I made it through clean first time. With a boost in my confidence I attempted a jump after the red bull road gap and it went wrong as I missed the landing and went through the tape and over the berm. I landed heavy on my shoulder I had injured a few weeks back and had to roll down the fire road feeling sorry for myself and pretty battered grazed and brusied. Saturday ended having only completed 2 and a half practice runs, no successful attempts at the motorway jumps and a broken body. Sunday, race day, was a new day. Painkillers, tape and putting Saturday’s crashes to the back of my mind and a positive attitude to try and enjoy the day. I had a really chilled steady practice run, no crashes, so I was happy. I knew my body couldn’t take another crash and I still had no idea if I could actually ride the track top to bottom without stopping, so I decided to conserve as much energy as possible in seeding, stay on the bike and get down safe. Catching another rider up after the hazard hoofer and still behind them going in to the motorway, I didn’t get to attempt the jumps as I wasn’t going quick enough, and I wasnt going to risk crashing. Race run, for the first time ever I didn’t really feel nervous, I remembered that my only goal had been to get down the track and I wanted to enjoy every minute of it. The wind had picked up at the top of the track, I’d never really ridden in those conditions before, being blown off line any time the bike left the ground. I had a clean race run, catching up with 2 of the other riders, one in the new narrow woods section, a real test of my composure not to panic brake and crash. I headed in to the jumps and hit the hip and the step down, but casing the step down I figured it best not to hit try the rest. I crossed the line with a time of 7.23 that I was really pleased with. I finished in 4th place, an unexpected podium and a clean race run. I’d done more than I set out to do and was over the moon, just that motorway section to go back and conquer another day! Mikayla Parton took the top step with an impressive time of 6.26, and teammate Becca put in a solid seeding and race run and finished in 9th just 12 months after surgery to repair a broken collarbone! Massive thank you to my sponsors Flow MTB for all of their support! The tropical vibes of the DHaRCO flamingo Jersey bought the sunshine to Fort William!